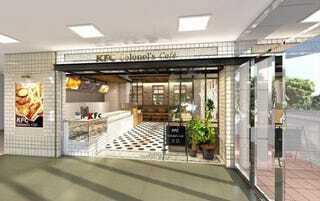 On November 28, the first "cafe type" KFC will open in Kobe, Japan. And it even serves pancakes and coffee. What does the "C" in "KFC" stand for again? The Colonel's Cafe will serve French press espresso as well as hot tea, such as Earl Grey or Darjeeling. Websites Entabe and Ryutsuu News add that there will be thick pancakes with ice cream, home-made style coffee jelly, shortcakes, New York style cheese cake and more. There will also be your standard KFC menu for those who go to KFC expecting to eat, well, KFC. The cafe will have potted plants and grainy wood tables, giving it a different vibe from other Kentucky Fried Chickens. If the Gayo Mountain coffee didn't already do that. Previously, KFC rolled out a chic Colonel bar, a Japanese style chicken vendor, airplane food, potato chips, and more.